QuickMenu is the internet's only true visual environment for creating web based navigation menus. Unlike the handful of semi-visual tools based around out-dated DHTML, QuickMenu generates pure CSS in a visual interface that centers around your actual real-time menu in a truly interactive environment.QuickMenu is in a class of it's own with over 400 customizable settings, dozens of exclusive visual features, and more than 20 add-ons. ...... our exclusive less nested Div / Anchor concept. * Search Engine Friendly: Menus created with QuickMenu are always search engine friendly by default, no additional mark up is required. * 508 Compliant: QuickMenu's pure CSS save option uses UL / LI list tags which are always set visible in the CSS by default for 100% 508 complaincy. * XHTML Validation: QuickMenu uses fully valid markup regardless of add-ons, styles, and extended features applied to the menu. * Scalability: QuickMenu automatically scales sub menu containers and items to fit the size of your text and the browsers font settings, regardless of features and add-ons employed. 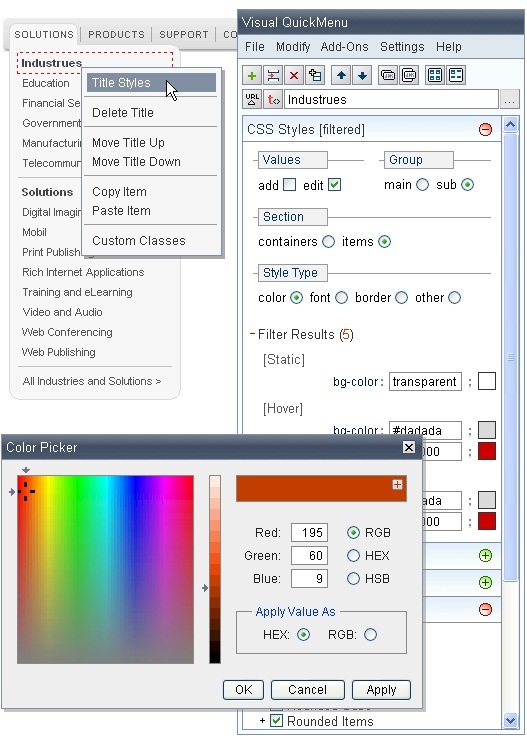 * Text or Visual Design: QuickMenu uses standards compliant symantically correct HTML and CSS. Switch between text based or visual design at any time with ease. Qweas is providing links to QuickMenu 7.3 as a courtesy, and makes no representations regarding QuickMenu or any other applications or any information related thereto. Any questions, complaints or claims regarding this application QuickMenu 7.3 must be directed to the appropriate software vendor. You may click the publisher link of QuickMenu on the top of this page to get more details about the vendor.